If Cold War, the opening film of this year’s Busan Film Festival, is heralding a new paradigm for commercial Hong Kong cinema, then I can’t say that it’s something I’m very excited about. Over-produced and austere, it features strong and slick production values but lacks the confidence, verve or panache of the likes of Johnny To. 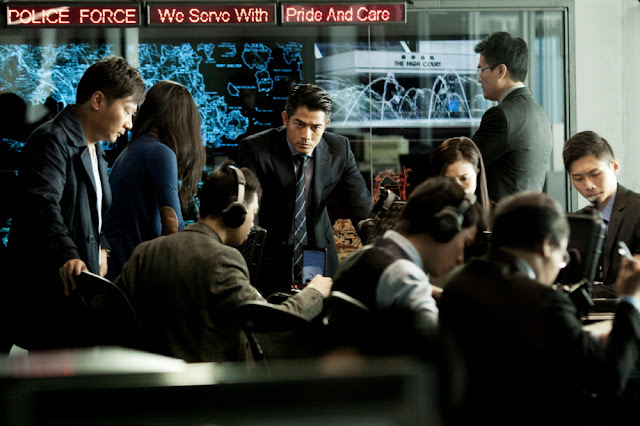 A potentially interesting tale of internal corruption within the upper echelons of HK law enforcement, the film mostly takes place in brilliant high rises, far from the bustling streets below. The colors are muted, the angles stark, and the production design is far too neat, all of which create a distancing effect: it's hard to get into the rhythm of the film. The lifeless performances, relentless pacing, bombastic staging and needlessly convoluted plot only add to the woes of this disappointing effort from two new directors which ample experience in the field. Leung Lok-Man and Luk Kim-Ching’s resumes as behind-the-scenes experts, Leung as an art director and Luk as an assistant director (including on the Macau sequences of this year’s Korean blockbuster The Thieves), are readily evident on screen, as the proceedings are immediately swept up in a concisely-edited urban aesthetic. Set pieces, though uneven, are often impressive. Taking a page from To’s book, some of the film’s best scenes are well-constructed sequences of breathlessly combined parallel scenes. I threw around the word ‘paradigm’ in my opening salvo and the reason I use it is twofold. First, the film has been pushed as Hong Kong’s most significant offering of the year: the marketing has been intense and I recall having seen dozens of different posters for it. Secondly, it feels as though they are making a deliberate attempt at forging a new aesthetic for the local commercial film industry. Hong Kong cinema, though frequently entertaining, can also be terribly messy. Plotting is often a problem and things tend to happen so quickly that pathos doesn’t fall into place very naturally. Things are still hard to follow here but Cold War is far more aligned with Hollywood productions (especially recent ones) than previous HK offerings. The blaring soundtrack and preference for shiny, elevated locations bring to mind Christopher Nolan’s recently-wrapped Batman trilogy. However, this operatic style, which is piled onto an already heavily-produced style of filmmaking, doesn't allow for individual moments to stand out, as such a technique is supposed to achieve. Rather, every scene is imbued with so much grandeur that it all gets a little tiring. While an attempt may have been made to push Hong Kong films in a stronger technical direction, the inclusion of some real pathos and humor would have gone a long way towards creating a work that audiences could readily sign-off on. They have plenty of time to prove me wrong but as things stand the duo of Leung and Luk is not one whose next work I will be eagerly anticipating. A very disappointing opening film, to an otherwise fantastic-looking program, that is unlikely to perform well outside of Asia.